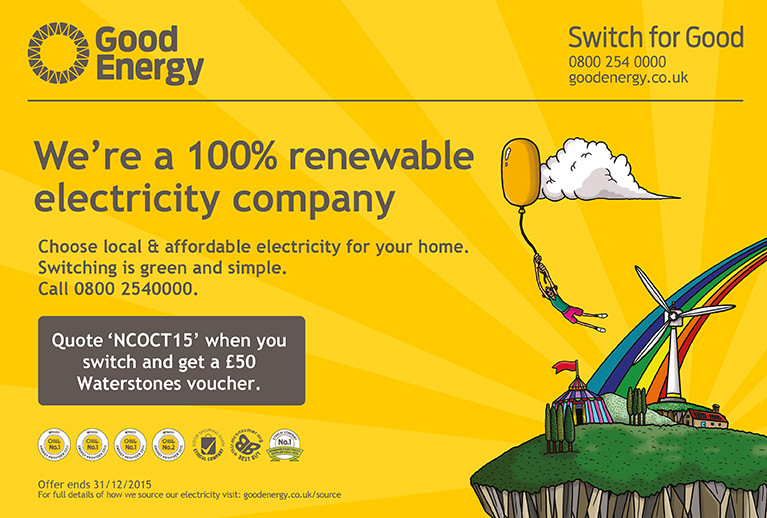 Good Energy's 100% renewable electricity is from British sunshine, wind and rain. Always has been, always will be. They were the first dedicated 100% renewable electricity supplier and today they supply over 55,000 electricity customers, 28,000 gas customers and support over 93,500 homes, business and communities generating their own energy. Choose local & affordable electricity for your home. Switching is green and simple. Call 0800 2540000. Quote 'NCOCT15' when you switch and get a £50 Waterstones voucher.